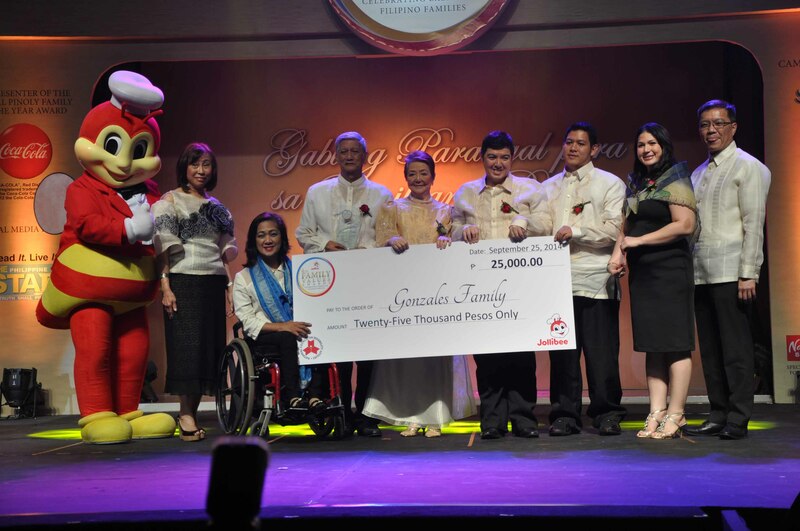 From 1,723 entries worldwide, the Gonzales Family was recently hailed as one of the six families who received the prestigious 4th Jollibee Family Values Awards (JFVA). The Gonzales Family was cited for their advocacy in raising awareness on autism and creating support to families who have members with the same condition. Mr. Octavio and Jean Gonzales with their children, including their son “Magiting”, a person with autism, received the award during the Gabi ng Parangal para sa Pamilyang Pilipino held at the Philippine International Convention Center in Pasay City. They were also accorded with Special Citation for Persons with Disability Category, upon endorsement of the National Council on Disability Affairs, as co-presenter of the award, which entitled them to receive P25,000 cash, a plaque, and P3,000 worth of Jollibee gift certificates. Each family winner received a cash prize of P100,000, a trophy designed by renowned brass sculptor and Ten Outstanding Young Men (TOYM) awardee Michael Cacnio, P10,000 worth of Jollibee gift certificates, and a Sony home theater package. The cash award will be used by the winners to pursue their advocacies in their chosen fields. In 1999, the Gonzales couple established the Philippine Association for Citizens with Developmental and Learning Disabilities (PACDLD), Inc. which provides counseling and livelihood for parents of children with autism, as well as art workshops for kids. In partnership with the Department of Health, the organization also holds seminars to identify children with disabilities, and trains daycare teachers, rural health units, and barangay health workers. The PACDLD also put up Parent Resource Centers in different areas across the country, where parents from poor communities can bring their children to get checked up and diagnosed for free. At present, they have helped construct four (4) Parent Resource Centers nationwide, located at National Children’s Hospital and Marikina City Health Office (in 2008), Baguio General Hospital (2009), and Zamboanga General Hospital (2010). The family’s efforts through the years have benefited around 10,000 families nationwide, from Metro Manila, Baguio, and Zamboanga. Dakila, the eldest who is based in Europe, helps fund the family’s projects and seeks assistance from like-minded donors abroad, while Mayumi, a teacher who specializes in autism, acts as a consultant for regular schools with special kids. Octavio and his son Marangal also provide sports trainings for persons with special needs, including boccia, a ball sport for those with cerebral palsy, and bocce, a game for people with intellectual disabilities. On the other hand, Magiting is a bemedalled athlete, and gainfully employed in a government agency as a library assistant. 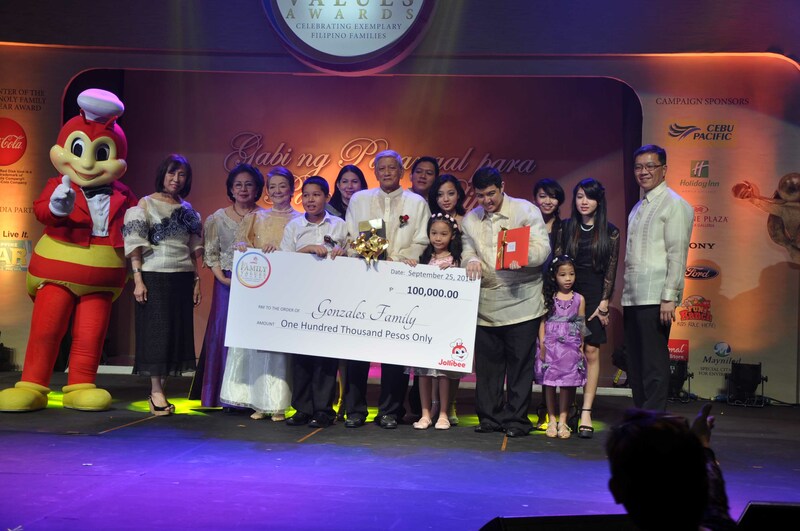 The JFVA is a prestigious awards program given to exemplary Filipino families whose notable advocacies have served as an inspiration and made a difference to their communities. This year’s distinguished JFVA Board of Judges was headed by Ombudsman Conchita Carpio Morales, Department of Social Welfare and Development Secretary Corazon Juliano Soliman (co-chairperson), and Jollibee Group Foundation President Grace Tan Caktiong. Previous winners of the JFVA included the Bernardo Family from Daet, Camarines Norte in 2013. Family head Mr. Rex Bernardo, who was the 2008 Apolinario Mabini Presidential Awardee, was cited for his active involvement with GAWAD KALINGA community service and motivation to succeed and make a difference in people’s lives and despite his disability, he has shown positive outlook in life to his wife and kids. Mr. Bernardo, an active advocate for persons with disabilities, also lobbied for the establishment of the Persons with Disability Affairs Office (PDAO) in their hometown, which was set up two years later. He has also worked with an NGO to provide underprivileged persons with disabilities with 40 customized wheelchairs.